This is rather shocking and disturbing, so let's all send a letter each to Korea's President and Mayor to help save our furry friends in Korea. Please also help to spread the word to your friends and families. Thanks! Greetings, and first of all congratulations on becoming the new president of Korea! While people all around the world have been paying close attention to the political and economic reforms you are promoting and to your political performance and achievements, we have heard a worrying, shocking piece of news – on the 24th of March this year Seoul Metropolitan Government announced a “Dog Meat Hygiene Management Policy”, which lists dogs as “livestock”! And it is also expected that, that after Korea’s parliamentary elections end in April, and after holding a related hearing in May, a proposal will be made immediately to the Central Government to amend the “Livestock Products Processing Act”, officially legislating that dog meat be listed as a livestock product. Therefore, animal protection groups from your country gathered in front of Seoul City Hall on March 25th and 26th to protest. Korea’s hi-tech and electronic products are sold throughout the world, and the so-called “Korean Wave”, which includes all kinds of entertainment, food and tourism industries, has also greatly increased the interest of people all across Asia in Korea, helping characterize Korea as a country of great culture and originality. 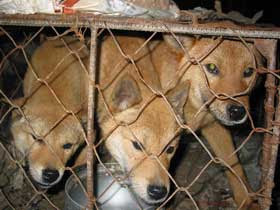 However, many people in Asia and the rest of the world see dogs as companions, and if you do indeed legislate that dogs are to be listed as “livestock”, this will make Korea the first country in the world to legalize dog meat consumption, and will make you the first national leader in the history of civilization to list dogs as “animals for consumption”! This will not only harm your country, it will also hurt all the people in the world who care about animal rights and civilized development. Our perception of the status and value of Korean culture and creativity, and of all Korean products, tourism and entertainment programs will suffer a great negative impact, and this may even lead to an “Anti-Korean Wave”! Dogs are simply dogs, and no matter whether in biological theory or in real life, they are not divided into pet dogs, companion dogs and edible dogs. Taiwan, Hong Kong, the Philippines and Thailand have all already legally banned the consumption of dog meat. Although there are still a few countries and people in Asia who still consume dog meat, their living standards are, on average, far lower than those of Korea, and until now there has never been a country which has, through national law, legalized the act of eating dog meat! People have raised dogs and cats as companions for at least twelve thousand years, and in the last 20 or 30 years, “anthrozoology” has gradually brought about a consensus: companion animals bring psychological and physical benefits to humans. They can give humans intimacy and support, alleviate the negative health impacts of stress, and also enhance people’s ability to prevent and resist disease. Modern day Criminal Sociology is also drawing the conclusion that there is a high degree of correlation between cruelty to animals and domestic violence and child abuse. Once dogs become animals that can be freely butchered for their meat, there will be unimaginable negative social and educational impacts on public psychology. In the course of civilization, humans always reflect upon the many cruelties of nature. Amongst the issues of environmental protection, “meat” has already been labeled a high-carbon food, and livestock farming is a major source of greenhouse gases. In order to create a more humane society, and for the sake of the sustainability of human civilization, we as co-citizens of this planet hope with all sincerity that your government will under no circumstances make this mistaken decision, causing humanity take a step backwards on the road to civilized development, and at the same time impacting on Korea’s foreign trade development. In addition, we hope that your government can, as soon as possible, prohibit the consumption of dog meat, in order to enhance animal welfare in Korea. In Taiwan, we have heard a worrying, shocking piece of news – on the 24th of March this year Seoul Metropolitan Government announced a “Dog Meat Hygiene Management Policy”, which lists dogs as “livestock”! And it is also expected that, that after Korea’s parliamentary elections end in April, and after holding a related hearing in May, a proposal will be made immediately to the Central Government to amend the “Livestock Products Processing Act”, officially legislating that dog meat be listed as a livestock product. Therefore, animal protection groups from your country gathered in front of Seoul City Hall on March 25th and 26th to protest.